This is what yarns I used and the increasing I did to knit my copy of the Blue Shimmer. I refer to the color chart available in "Poems of Color" by Wendy Keele, page 97. I am not posting it here, because it is not my work. You'll need a copy of the book to knit this sweater, but the size I knit is larger than any available in the books. These directions assume that you already have read the book and understand the construction method for the Blue Shimmer; I'm just offering the numbers for the larger size, and the colors for the alternate yarn. SIZE: For a 44 inch/96cm bust. Length can be adjusted as needed. Powder blue is the main, body color. Size 2/3mm circular needles in assorted sizes for stranded color yoke. Size 1/2.5mm circular needles for solid color body and sleeves. GAUGE: 35 sts over 4 inches/10 cm. Ideally you should get this gauge over the stranded color and the solid color. DIRECTIONS: This sweater is knit from the top down, in the round. 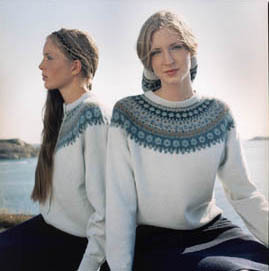 Switch to larger needles and begin chart from "Poems of Color" page 97. At round 11 of chart, increase 60 stitches to 252. At round 19, increase 68 stitches to 320. At round 34, increase 64 stitches to 384. At round 50, increase 56 stitches to 440. At round 64, increase 46 stitches to 486. 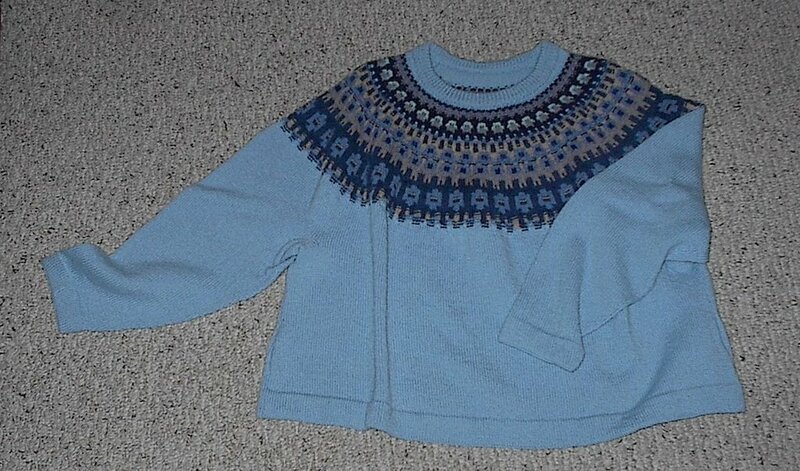 At first solid blue round after the yoke patterning, switch to smaller needles and increase 46 stitches to 532. Knit yoke to desired depth, about 9 inches/20 cm. Separate body from sleeves; 161 front stitches, cast on 31 stitches across arm pit, 161 back stitches, cast on 31 stitches for other arm pit. Total, 384 body stitches. Each sleeve contains 105 stitches, plus 30 stitches picked up from armpit. Total, 135 stitches. Decrease two stitches on each side of the center underarm stitch, every fourth row. At 68 stitches, knit to desired length. At cuff, work purl round for fold, then knit 1.5 inches/3.5 cm for hem. Fold under and stitch down. Knit body to desired length, work purl round for fold, knit 1.5 inches/3.5 cm for hem. Fold under and stitch down. Fold under 1x1 ribbing at neck and stitch down. good morning dudes. I'm honestly into shoes and I had been looking for the sake of that singular model. The prices for the sneakers were approximately 340 pounds on every site. But completely I base this location selling them as a remedy for half price. I really love those [url=http://www.shoesempire.com]prada sneakers[/url]. I will definetly purchase them. what is your opinion?